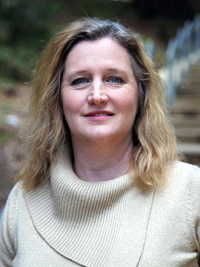 UC President Janet Napolitano has selected Sue Carter, professor of physics and associate dean of graduate studies, as one of ten recipients of the inaugural Award for Outstanding Faculty Leadership in Presidential Initiatives. The honor recognizes Carter's efforts to deepen climate change teaching and research at UC Santa Cruz in support of UC's Carbon Neutrality Initiative. In a letter informing Carter of the award, Napolitano wrote, "Through your bold and creative efforts, you have rendered service of the highest order, embracing and furthering the University's historic mission of teaching, research, and public service. Your inspired leadership in advancing the initiatives will have a long-lasting and positive impact on this and future generations of Californians." Carter, who directs the Center for Innovation and Entrepreneurial Development, was also recognized last year as the first recipient of UCSC's Faculty Climate Action Champion Award. Her research focuses on energy-related technology including photovoltaics, solid-state lighting, and luminescent solar concentrators.